I can see why people often sign up for Retirement Annuities (RA’s) through a financial adviser (paying away a lot of their returns in the process). The RA landscape is quite literally a minefield of hidden charges, commissions, poor performance and what-the-hell-is-going-on-under-the-hood? Who wouldn't want some help? So when a Financial Adviser presents someone with a nice glossy brochure showing them that everything is going to be okay, you can’t blame them for asking where to sign. But with so many moving parts, how does someone go about choosing the best RA? Huge disclaimer right up front - I am most certainly not a financial adviser, and the below is most certainly not financial advice blah blah blah…. Let’s hypothetically assume that I abandoned my early retirement plan (and the disadvantages of using an RA to get there) and instead followed a more “normal” 35-plus year career, retiring after age 55. I could well be enticed by the tax benefits of an RA. Naturally I would want to sign up for the best RA. So maybe first off I should try and define "best". To me the best RA would be the one which gave me the most money at the end. Not so? Maximising your investment is the whole point of trying to make sure you pick the right RA. So the next question is - What are the factors that will influence the final investment amount? Now before we go any further, this might be a good place to explain what exactly an RA is. A lot of people are under the impression that it is a mystical and complicated beast which only the experts fully understand. But it is actually quite simple. An RA is basically a bucket. And in this bucket you can put investment products (or blocks). These investment blocks are pretty much just like any other investments – Unit Trusts, Cash and the like. The reason they are put into an RA bucket is so that the investment blocks can enjoy the Tax benefits of an RA and can be monitored to ensure that they adhere to the rules of an RA. So as you can see, the product is not maybe as complicated as many would have you believe? Now when you consider the fees of an RA, you need to remember that there is usually an annual fee for the “Bucket”, and then each "Investment Block" in the bucket also has an annual fee. And if you signed up for your RA through a financial adviser, you can be sure that they are happily shaving off their cut every month as well. So as you can see there are a few layers of fees involved with an RA. And the lower you can get these fees (ideally 0!) the better. Why? So I think we can agree that it is best to keep your RA fees low. That’s already a lot better – if it's the monthly fee type adviser you will probably score at least 1% a year by doing this. (In the same 10x example from above that would be around R950k saving.) Yes, a D.I.Y. approach to your RA is going to take some effort, but not as much effort as trying to make up R950k! You are now left with only 2 fees – the fee of the bucket, and the fee of the investment blocks in the bucket. So now it becomes a question of which RA providers give you the lowest bucket and block fee combo? More on this in a moment, I first want to quickly touch on the other factor affecting the outcome of your RA investment - performance. There is no escaping the fact that different investment blocks will perform differently. Some will give spectacular returns, and some will be epic disasters. No problem though – all you need to do is make sure that you fill your RA bucket with only the best performing blocks. Easy peasy. 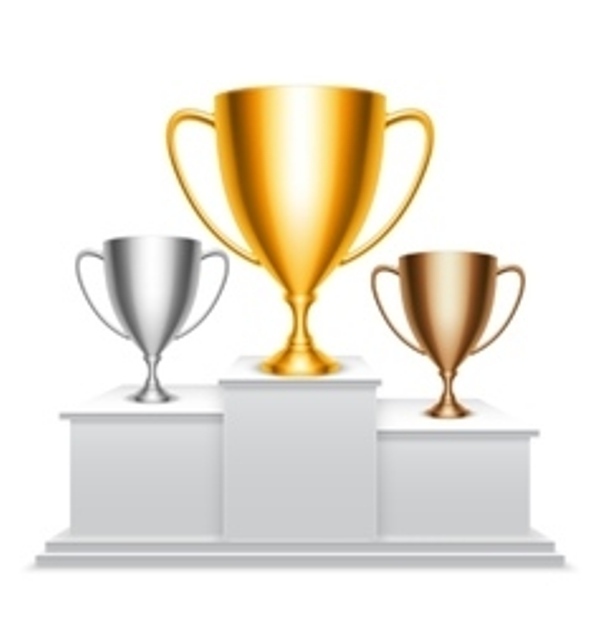 The problem is that there is no way of telling which blocks will perform the best. Research confirms that past performance is a pretty useless indicator of future performance. In fact the only thing even slightly correlated to future performance is fees. Investments with lower fees tend to outperform those which charge higher fees – irrelevant of past performance. So the two factors (fees and performance) in determining the best RA for your money can actually be whittled down to only one – Fees. And for this reason, in my opinion, fees are the only thing you should consider when choosing your RA. On average, the RA with lowest fees will give the best outcome for the average investor. And this helps a tremendous amount in narrowing down the 100’s of RA options out there. It get’s a lot simpler when your only criteria is fees. To my knowledge, the three options listed below are currently the most competitive RA offerings in South Africa when it comes to bucket fee and block fee combos. This is the new kid on the block, their product only launched mid-January 2018. Their “bucket” fee is pretty good at 0.342% p.a., and then they charge 0.684% p.a. for the underlying investment block. So total charge for the RA is 1.026% p.a. You can choose between three investment blocks - High, Medium or Low Equity (depending on your risk profile etc.) The make up of each of these blocks consists of a group of ETF’s. It’s a bit of a strange concoction including some smart beta products - I would personally prefer some plain old vanilla index trackers if I'm honest. The really nice thing about the Easy Equities offering is that there are no minimums. If you only have R50 a month - no problem! 10x were one of the first companies to try shake up the RA industry with a low cost passive product. Their RA does not distinguish between the “bucket” and the “block” fee and they just charge an all in 1.026% p.a. I like this approach - just one fee to look at. Total fee = 0.7875% per annum. Nice incentive to grow your investment though. Also nice (or maybe not nice, depends how you look at it) is that 10x will automatically move you into more conservative asset classes as you get closer to retirement. The minimum amount 10X will accept is R1000 per month or a lumpsum of R25 000. Note that I am specifically mentioning Sygnia Skeleton here (and not just Sygnia). 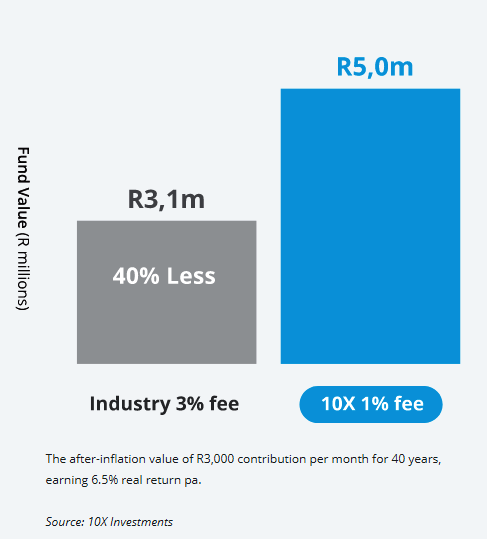 The reason for this is that while the Easy Equities and 10X options only allow their own underlying investment blocks, and you don’t get a lot of say, the Sygnia RA bucket allows you to invest in a whole host of different investment blocks including Unit Trusts from just about every provider in South Africa. So there are plenty of blocks to choose from for your RA bucket. But the real benefit of the Sygnia RA is if you ignore the “look at all our blocks feature” and instead just put in Sygnia branded blocks (the Skeleton range) in the bucket. If you do this, then the nice people over at Sygnia will waive their bucket fee. That’s right 0% bucket fee. You only pay for the Sygnia investment blocks, and these happen to be pretty cheap at just 0.65% p.a. The minimum investment amount to open an RA with Sygnia is R500 a month, or a lumpsum of R20 000. Below I have put a table to sum everything up, ranked in my order of preference. Maybe worth mentioning that if you end up with either of these RA’s you will do okay – they are all a lot better than some of the totally convoluted and rip off stuff out there. But I guess I have got to choose a winner, and personally, if I was in the market for an RA, I would go with Sygnia and their Skeleton Balanced 70 fund. Dirt cheap, and in my mind that is all that matters. Choosing second and third place is a little more tricky, as the 10x and Easy Equity offerings are very close in terms of cost. Easy Equities has the no minimums thing going for it which is really fantastic for those who don't have heaps of money but want to get started. Hopefully this will encourage all those who want an RA but thought they didn't have "enough" to get cracking! 10x has the option of lower fees when your investment grows large enough, and over a long period (some RA's run for more than 40 years) it is likely that you will be able to reach the lower fee threshold. And since for me fees are everything, I think 10x just beats Easy Equities into second place. The nice thing about all three of these RA's is that it is possible to move over to a different provider relatively easily. So if you want to start an RA but only have a few hundred a month or a small lump sum, then start with Easy Equities, and once your investment grows large enough you could move it over to whoever is the cheapest at that point. In truth this article is not going to age well. And that is fantastic! The industry is forever changing (mostly for the better) and I am very hopeful (and pretty sure) that this article will become obsolete a few years from now - because providers have lowered their fees even further and there are newer even lower cost providers. Wouldn't that be great! Once again let me stress I am not a financial adviser, and you need to make your own decisions which take into consideration all information and factors relevant to you. An RA decision can be a biggie (and can often run into the millions of Rands) so do your own risk assessment and due diligence. It is entirely possible that I may have overlooked some other competitive RA offerings – I am but a mere mortal. If there are others that I may have missed be so kind as to point it out in the comments and help anyone else in the process of navigating the RA minefield. I am in no way affiliated with Sygnia, they just happen to offer what in my opinion is the best RA option currently available. Where the RA provider offers a a few different "investment block" options, you need to factor in your time frame and risk tolerance. Generally, the longer your time horizon, the more risk you can take and the more aggressive you can be. But once again you should do a proper assessment. I am a numbers kind of guy, and that's why my assessment is based mostly entirely on numbers. For some people a slick interface, pretty pictures, good customer service etc are important too. I haven't factored any of that stuff in. Moneyweb did a similar assessment of fees (although the Easy Equities option wasn't available yet.) Their exact numbers were slightly different (they decided to include Transaction costs for the 10x product and this would make the Easy Equities option cheaper.) But from what I have seen on 10x website, the Transaction cost is included in their total fee - but maybe something worth confirming with them if you are interested in signing up. Either way, it still doesn't change Sygnia as the outright winner. You can find the Moneyweb cost comparison article here.